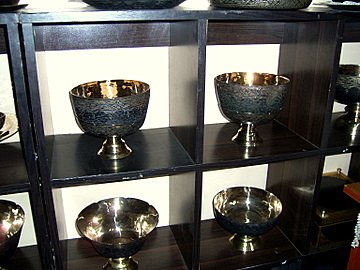 Thai bronzeware is a little known Thai handicraft in making stone polished bronze bowls or "khan long hin," an art that has been handed down for six generations since the Ayutthaya era. This old traditional bronzeware craft is a specialty of the Ban Bu community in Bangkok Noi across on the Thonburi bank of the Chao Phraya, a craft that has survived for more than 200 years! 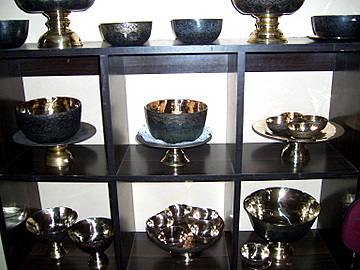 Bowls and trays are made from smelting copper and tin to produce the bronze alloy sheet. 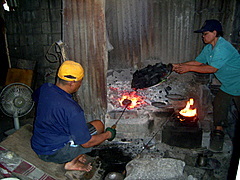 These sheets are then heated in a charcoal fire and repeatedly hammered by two persons in turn to the required shape. It's a hot, laborious and tedious process. The next stage consists of grinding and smoothening the surface of the bowl to refine the shape further. 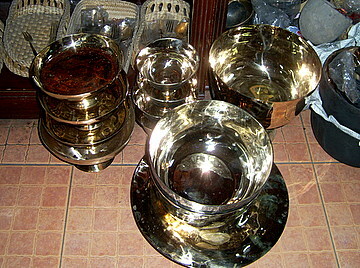 The bowls and trays are traditionally polished with stone to a fine glossy finish. Intricate designs are then etched on to the surface. Designs can be done on request. 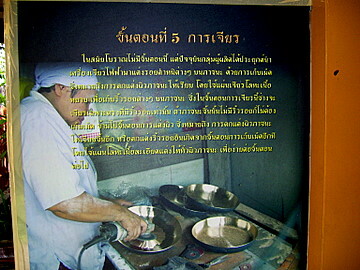 All the steps in producing the Thai bronzeware have been preserved since the old days, except today, electric tools have replaced the stones for polishing. 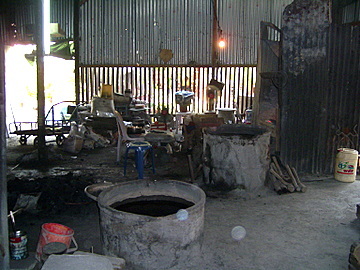 The Jiam Saeng Sajja Bronze Factory, which produces this Thai bronzeware, is located in Bangkok Noi near the Bangkok Noi Museum. The factory is part of the OTOP program to promote traditional Thai arts and craft products. OTOP (One Tambon One Product) is a government project to promote indigenous Thai handicraft among the various sub-districts (tambon) in the country, both for domestic sales and exports. With state support in marketing and promotions, the craftsmen can then concentrate on producing their handicraft and preserving the art. The showroom has several beautiful pieces of bronzeware on display. These include bowls for fruits, salad, sugar and cream with elaborately engraved designs. 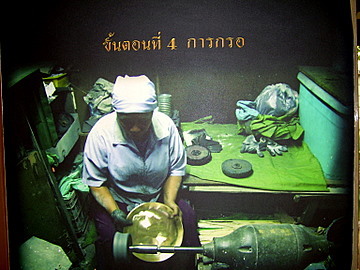 In the workshop behind, men and women toil laboriously on producing the Thai bronzeware, beating away continuously. Given the arduous task, it's no surprise that the craftsmen and women are mostly middle-aged. 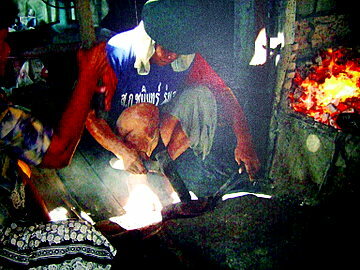 As it takes years to perfect their skills, few young people wish to take on this craft. Can this traditional art of Thai bronzeware be preserved for future generations? Early on 6 January 2006, a fire razed 35 homes in the Ban Bu community in Bangkok Noi. The cause of the fire is unknown. The store of the famous Jiam Saeng Sajja Bronze Factory was completely destroyed. Luckily, the workshop with its original tools for making the bronzeware is still intact. As one of the 12 old communities designated to promote tourism, we hope that efforts can be made to help restore the Ban Bu community. 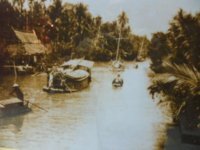 I tried to call the Jiam Saeng Sajja Bronze Factory in the Ban Bu community in Bangkok Noi in early March 2007, in the hope that they might have reopened for business. I feared the worst when I didn't get a reply for several days. Well, on 8 March 2007, someone answered the phone and redirected me to another number. The factory has reopened for business in the same location. 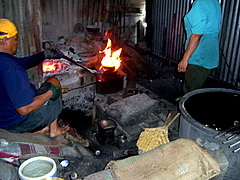 I revisited the Ban Bu and the Thai bronzeware factory on 4 February 2009 to take the photos for this page. It was more than four years since my first visit and I had a little difficulty finding my way through the narrow sois. I’m grateful to the friendly and helpful people in the neighborhood. The site of the old showroom which was burnt down is now a garden with a sala. The old workshop is still intact and the new showroom is to the rear of the grounds. There are six steps in the making of the bronze utensil. Imagine how tedious it would be to do this with stones and not modern electric tools. This is the toughest part. It’s hot and tiring work. I only managed to get a shot of the heating process. All the other steps were not in progress unlike my last visit. Perhaps it’s a sign of slack demand. So I’ll have to use photos from the posters for some of the steps. 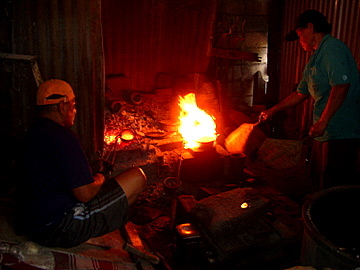 Two people sit by the fire and alternately heat and beat the metal into the desired shape. This stage is to knock out the bumps left from the initial heating and hammering. The bowl is fitted to a lathe to smooth out the interior and exterior surfaces. Filing the mouth of the bowl to make it perfectly circular and to cut designs on the surface. The stage was only added in modern times. It’s like a bigger version of the brush the dentist uses to polish our teeth! The purpose is to remove scratches and marks from the surface. In the old days, fine stones or burnt earth wrapped in cloth soaked in coconut oil were used to shine the surface of the bronzeware. Today electric polishers are used to bring the bowl to a shiny finish. Here’s the finished product. Eight large bronze bowls take about four days and six people to complete the task. During my visit I noticed work in progress to build two new piers and a tiled walkway. 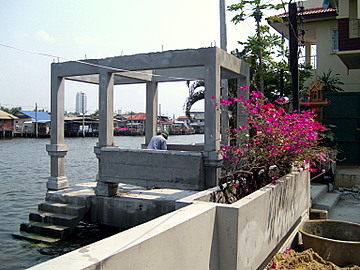 These piers are meant for the tourist boats which ply the Bangkok Noi canal. Hopefully this will bring more visitors to sustain this old community in Bangkok. It’s open every day except Sundays. Give a call before you visit though. The factory is about 500 m from the Bangkok Noi Museum. I wish to thank Khun Metta and Khun Doi for their kind permission to photograph the showroom and workshop and for the information on the process of making Thai bronzeware. To return to Bangkok Communities and for more Traditional Thai art.